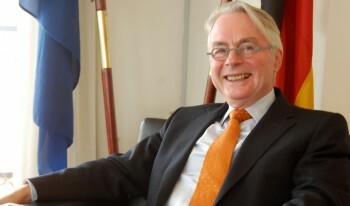 The Ambassador of Germany to Nigeria, Mr. Michael Zenner has said that the German government through its embassy in Nigeria promotes cultural activities with the aim of building mutual understanding between both Nations. Mr. Zenner noted that besides political and economic relations, cultural relations form the third pillar of German foreign policy, adding that it is one of the most sustainable and visible instruments. He also observed that the promotion of cultural values represents a significant contribution of utmost importance in efforts geared towards creating and maintaining peace amongst people globally. Speaking recently at an event themed: “Blackman in European Kitchen” presented by a Nigerian artist based in Germany, he explained: “Promoting the visual arts and exhibitions is an important part of the German Federal Foreign Office’s cultural activities."